Following on from the EASC topic what is the history of the Peterboro allnighters? EASC for the first couple of years or so of th decade? What was the clashing that finished EASC and who took over etc. Hi Chalky, I think Steve G will be your man for this as he was in Peterboro at the time. I remember seeing both Guy and Keb there just as they were trying to get the Mafia thing going... The Fleet never seemed to be that receptive to new stuff (60's or Modern) on the occasions I went from what I recall..
Hope you are well mate. I know Jon Buck and Danny Everard ran nighters mid to late 80's. I know Ken Cox was there 80-82? Need to know what clubs have been involved, who ran them and of course the politics that was obviously happening. Officially - Peterborough Soul Club which was set up after Wigan had closed, started putting all nighters on at the Wirrina which was a box indoor 5 a side, I think they use to do roller disco there as well - venue. During the winter months the place was freezing even off your neck - so it was decided to clash with the EASC free night same date. One thing the PSC had over the EASC was that the younger crowd had come up through various local Soul and Scooter Soul venues at Bretton , Orton, etc additionally they knew that chewing gum which kept them awake was always on tap. I don't know what the support was at The Fleet that night - all I know is that Ken Cox decided that, that was the last night. 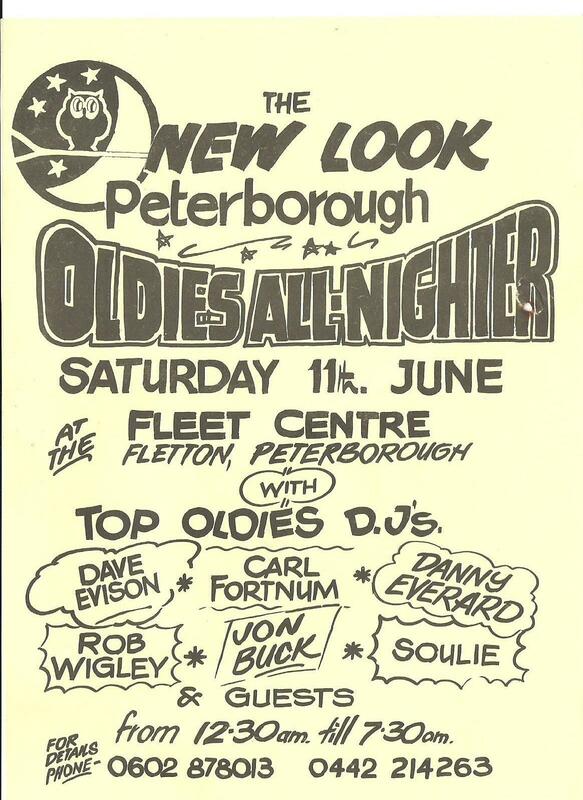 Peterborough Soul Club took the fleet over I think till about 86ish when one of the guys got tugged for supplying stay awake chewing gum. As for the clashing not sure but from 1980 ish ? think -the Wirrina 82? was still happening some great live acts at the time run by the all nighter club of great Britain was it Chris Burton -the Fleet was run at some time by Dave Read must of been 80s Phoenix soul club not sure who run that -St Ives not that you ask think the last one EASC run was 79/1980 an all dayer after that well early 80s was Russ Towers amongst many others but not Peterborough I'm sure ill be corrected may be ? Ken Cox was running the EASC well into the 80s, I DJed for him there first in the early autumn of 1982 and walked to the Fleet from Orton Brimbles with a 200 count box and my then wife. The Peterborough Soul Club was Dave Reid, Keith Wilcox and some Scottish guy and his bossy mum who lived in Bretton. The nighters at the Fleet 82-85 I was a regular DJ on….other DJs included Brian Rae, The Vicar, Adam, and a couple of others whose names escape me now, I think Dave Evison was also on, I'll see if I can find a flyer. I always remember finishing one of my sets there with CL Blast "Love don't feel like love no more" which i'd just got from Soul Bowl for £1.50 (LP) and the vicar, the next DJ, looking on in absolute horror….before starting with Trypt on Love by Wakefield Sun. 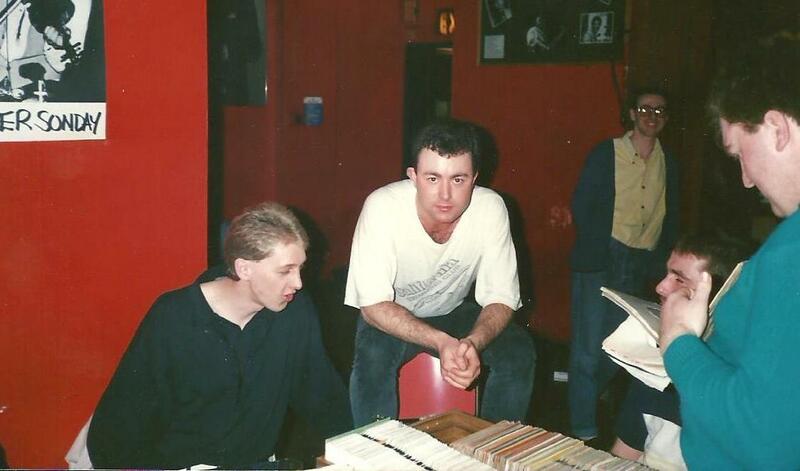 The back room record bar was a hive of activity Raistrick, Butch, Tommo, Lawson etc. all there. Chris Burton started putting on live events at The Wirrina, Jr Walker, Eddie Holman etc. About 83 or 84 there was a clash with PSC putting on a night at The Fleet and Burton putting on a night at the Wirrina. That was the night of the famous bombscare. I was on at the Wirrina that night. I remember Burton getting one of the DJs to help him jump start his car, Russ from Stamford I think it was. Anyway later we realised that Burton had gone home and a number of us DJs hadn't been paid. Had to cha se him down for the money. Ha ha fun days! By 84 Dave Reid had started the Dedicated Soul Club….and I worked for him too. Bomb scare I have heard about, which venue and promoter/promotion was the target of the scare? Heres a flyer from 1985. As well as The Fleet by then (1985) I was also doing odd gigs for Steve Allen in town and was about to start up Papa Luigis modern do's with Nick Gilbert, Robin, Max, Soul Sam etc. Upstairs at the old pizza place. Wirrina was at its biggest mid 70s I'd say with Sam, Vincent, Poke etc. I am afraid the 80s do's there weren't as good. I would add that the scene in P'Boro in the early 80s was pretty divided. Skins, mods, northern….they didn't always get on. I did a cartoon (which I never published) of Tommy Hunt appearing (which he did) and a load of Skinheads zeig- heiling and expressing horror that Tommy was black! I only remembered that cartoon because I found it the other day in a box! So it must have been pretty political then. Orrible, nasty piece of vinyl. Loved the Fleet - was my first regular allnighter (hence my only going to Stafford a couple of times - couldn't afford to travel that far on my own) - used to ride down every month with Martin Midgley from Bradford (best acrobat I ever saw) and Striker on scooters from Hull. Back room used to be great to dance in - pitch black. Used to be a lot of really crap squad (rugby shirts and trainers) that used to get a lot of very vocal abuse - later Cambridgeshire muscled in and then they got nasty, pulling people off the dancefloor, grabbing people in the Coach and Horses car park, pulling people on the approach roads etc (specially the night Smiggy, John, Pauline, Annecia and Anne got had - though that was Mr Buck's period). Dedicated Soul Club started 83 (I have the patch dated 83) - ended because DR got rounded up in Crossbow as I remember. Dave made a living running dodgy burger vans on Scooter rallies and running events at rallies. A lot of great 70s/modern being played there - Eddie Holman, Lifestyle, the Softones, Alfie Davison, Greg Perry, Sadane and Skip Mahony etc etc etc being really big sounds in the main room. A lot of course more or less new releases at the time - for which I guess we have SG to thank. Growing up I had heard so much about the Fleet early 80's, made it to the 10th Anniversary and what a great night, think that was about 88 ? A lot of great 70s being played there - Eddie Holman, Lifestyle, the Softones, Alfie Davison, Greg Perry, Sadane and Skip Mahony etc etc etc being really big sounds in the main room. Dave and Keith are still about, I saw them a couple of years ago. I don't know what happened to the scottish guy (Davy?). You're right about the modern being played at The Fleet, Phillip Mitchell, Curtis Hairston, and Charles Johnson were other favourites in the main room. I only went to the Fleet a couple of times with the Boston crowd - would have been early 80's I guess, when I was still living in Lincolnshire. I remember being quite ill on both occasions. The really odd thing is that I always had it down as being an oldies venue - and never went in the later years. I can't have been looking very closely at the DJ line up - funny that. There used to be a midweek do under the dedicated soul club banner at the 3 Cups in Chelmsford then a regular fort nightly Saturday Niight at the Chestnut Centre in Vange. Used to go to the Fleet on & off from 1979 to 1986, Remember the Modern sounds, Independant women - jan Jones, How can I tell her - Curtis. My baby's got ESP - Four below zero. Even heard Searching - Change and Never too much - Luther Vandross played. Went to one of the modern dos upstairs @ the pizza place, the sounds were great but don't remember it being well supported. Were Maxine and Dave (Boston) part of that crowd Peter? Those names ring a bell mate. Dave Appleyard? Other Boston people I knew quite well then were Mick Bradbury, Figgy, Aidy Bradbury (sadly passed away), Anita - who I think was a nurse, Andy Rix, Steve Handbury etc. Quite a few others too but my memory isn't what it once was. I also recall going with Mick and his parents to visit Richard Bradbury in Lincoln prison - he once made a match stick model of something or other - bless! I also knew/hung out with the Lincoln lads and lasses at the time. Dave Appleyard by any chance, top lad. It was largely oldies apart from Adam and me. Yes Change Searching I remember that being spun at the Fleet. We did 3 or 4 at Papa Luigis, I seem to recall 50+ being in, although one might have been a bit less. It's so long ago I can't remember now. I seem to remember it being the first venue that Fish (Mark Coddington) ever went to. I thought they were good nights, but then again I am biased. Ploughing a lonely furrow Steve. I would have been meaningfully engaged elsewhere! Out of interest it would be great to see some of your playlists from the Fleet. If you get a chance - and or can remember! That would have been the Vicar or someone, not us. I think the "Scottish guy and his bossy mum who lived in Bretton" would have been Stuart Gordon. He used to run various soul nights in Bretton which, as a young Mod, is where I first discovered northern soul. Thought they were 74 / 75 - not 1980 onwards , could be wrong ? Remember them nights well Rob. Have several of the RSG flyers. I used to badger Rob for his copy of the Embers "First Time" at the Fleet, great times. Just found this Chalky ! where was this Rob? That is Rick from Chesterfield sat on chair back I think, now lives in Poolsbrook round corner from me mother. When did PSC stop running it then about 85? I know I stopped going about that time because it was really basic oldies, "Right Track", "Cause your mine" etc. every time, three times a night. Awful. Wowser, these comments bring it all back ..... EASC when it moved to the boro, Bomb scare,during the Eddie Holman / Jnr walker niter , helping the Rev clayton lug his gear around (PA , not sweeties?) . Meeting up with Brian Rae at the road hog for breakfast, winning a UKdemo for guessing the TMG number of it (how the hell did I know that) . Biz and me lived and breathed niters during those times, I've forgotten much more than I can remember,. But looking back, there was a lot of politics and bitching, even back then,. Not a lot changes does it ? Did you used to set off from The Falcon in Boston or The Pied Calf in Spalding? Some place in Boston Simon - can't remember where exactly, but it was on a mini bus. Indeed she was a SEN, I think on the isolation ward at Pilgrim hospital. Often seen driving a yellow Mini with Malc Evans riding shoot gun. Yep! The yellow mini. Never got to know Anita too well - I was a newbie and a young kid, she was always really nice to me though. The E.A.S.C. was initially Paul Donnelley and co at the Wirrana. Ken Cox then registered the name after they had had two or three all-nighters, because of this the Phoenix Soul Club came into being. The council closed the all-nighters down in 1976 and said no more all-nighters would be held in Peterborough. The Fleet then came into being three years later. 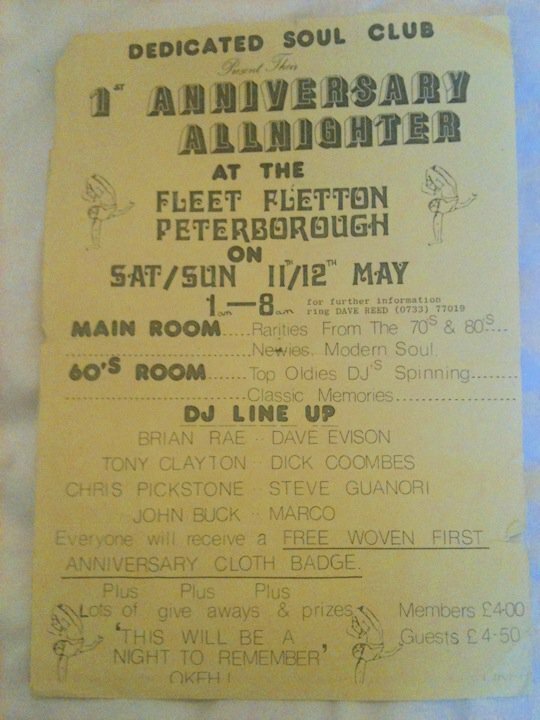 Who was first at the Fleet...Peterborough Soul Club? Run by Dave Reid, Keith Wilcox and Stuart Gordon (and his bossy Mum as former attendees called her). Tony Clayton also getting involved later? Then came the Dedicated Soul Club in May 1984 going by Steve's flyer run by Dave Reid. Around this time Chris Burton attempted to muscle in on the action holding all-nighters at the Wirrana on the same nights as established local Promotions resulting in a bomb hoax at one all-nighter at which Junior Walker & Eddie Holman were appearing live. Fair to say that the mix of Skinhead and Scooterists and Northern Soul lovers didn't mix well and trouble was to flare on numerous occasions. Anything to correct or add? Any chance of a scan of this flyer Steve, 300DPI if possible? What time was this, 1986 & after? I never saw any violence, but did hear of a large rumpus which ended up with people being chased through the brick yards and someone losing an ear, but I thought the occasion was predominantly a skinhead orientated do. Yep, not sure who was on at the Wirrina that night but it was one or other, not both. I am sure Ken Cox ran the Fleet in 79-82. I also think that PSc clashed with Burton's date not the other way round. Clayton was certainly involved by 82-83 but only as a DJ for PSC / DSC. Also remember that it wasn't just Peterborough people at the allnighters; people from all over came so it would be wrong to categorise it as skins v mods v northern soul etc. But it would be fair to say that PSC didn't like competition in the town hence the rumpus at Stamford when Russ Towers got his face smashed in. The bomb - no one got to the bottom of who planted the shoe box with wires etc. at the Wirrina. I remember we were let back in after 20 mins of the police finding the devise. Today the whole town would be cordoned off for a week. Different kind of bombers back then Steve. Looking back, PSC at Wirrana from 1979 with Ken Cox over at the Fleet? until the PSC clashed with Ken (EASC) forcing Ken Cox to call it a day, PSC then took over the Fleet in 1982 until 1986. Then RSG. Chris Burton promoting at Wirrana in 83/4 and then the PSC deliberately clashed resulting in a bomb hoax at the Wirrana (I have ben told the details btw but I won't repeat in public). Who was running the Stamford event?